This little device can be used for your headphones, home sound system, car stereo and protable non-bluetooth device. 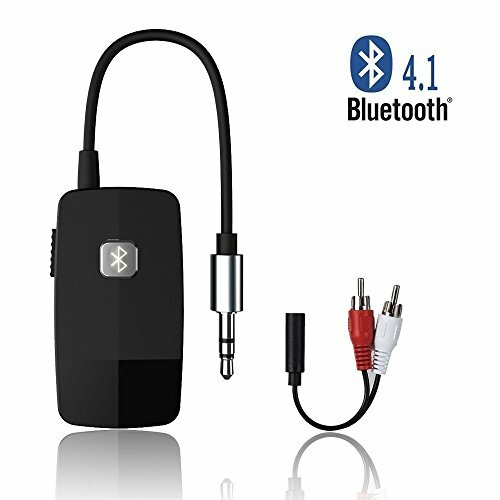 ★ Featured Bluetooth V4.1+EDR : Advanced CSR 4.1 chipset combining A2DP comes with stable connectivity and remarkable signal stability. Non-stop and clear HiFi music streaming creates enjoyable listening experience.Ideal to be used for your wired Headphones/Speakers, home sound system,car stereo and portable non-bluetooth device via the 3.5 mm or 2.5 mm RCA audio connector. ★ We believe in our products - That's why we back them all with an 12-month warranty and 30 days money back and provide friendly, easy-to-reach support. - Free Lifetime Technical Support.If you are searching 2-in-1 bluetooth transmitter & receiver,please find the ASIN: B01NACN8PY or B01NH58CCX and they are on Hot Sale.